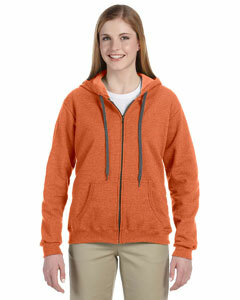 Made of 50% cotton 50% polyester Heavy Blend fleece. Air jet yarn creates a smooth, low-pill surface for printing. Cross-dyed shades (two colors in one fabric); Contrast Dark Grey trim. YKK brass zipper and flat drawcord. Pouch pockets. 1x1 ribbed cuffs and waistband w/ spandex; set-in sleeves. 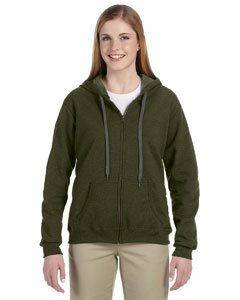 Three-needle topstitch hood, pocket and waistband; unlined hood.